Some interesting campaigning is going on in my neighborhood of Segambut, P117, where Jayanti Devi Balaguru of GERAKAN, under Barisan Nasional, will contend with Lim Lip Eng of DAP, under Pakatan Rakyat. 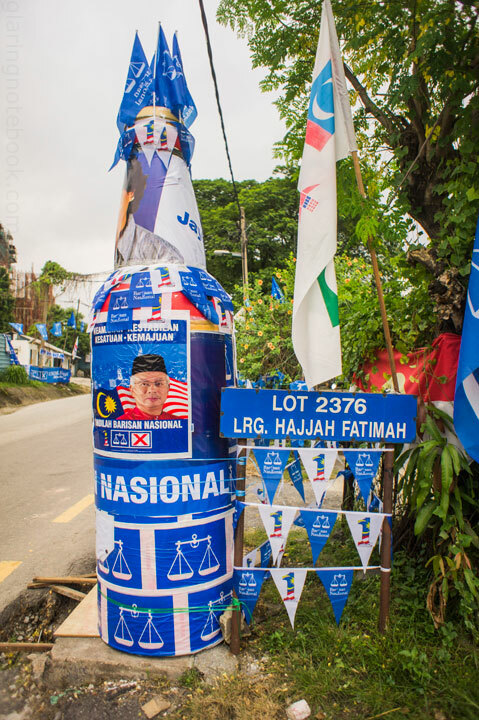 Here, in Segambut Dalam, we see Barisan Nasional chairman and incumbent Prime Minister, Najib Razak, on what appears to be a bottle! Another view from the side, with Jayanti at the neck of the bottle. View from the other side of the road, Jalan Segambut. 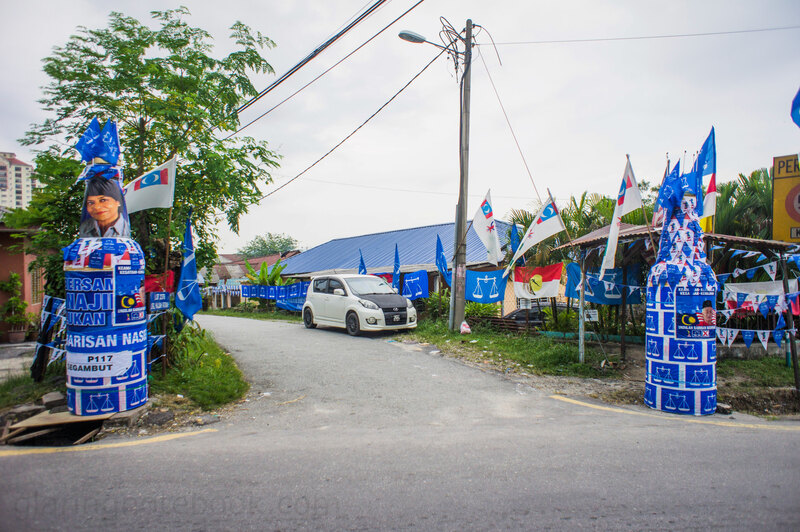 Interestingly, this road used to be full of BN and DAP banners. The DAP banners have since disappeared. One could suspect the BN party workers of removing the DAP banners, but that also means that DAP has less flags to take down after the elections. 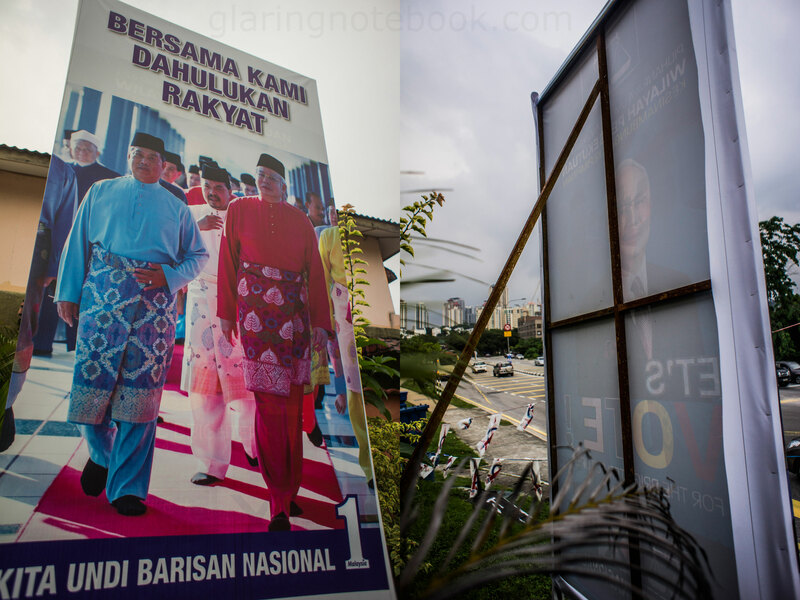 Meanwhile, closer to home, is an interesting poster – it used to be just Najib Razak on a poster, with the caption, “LET’S VOTE !” with that horrible space before the exclamation mark. That is just bad, bad English. 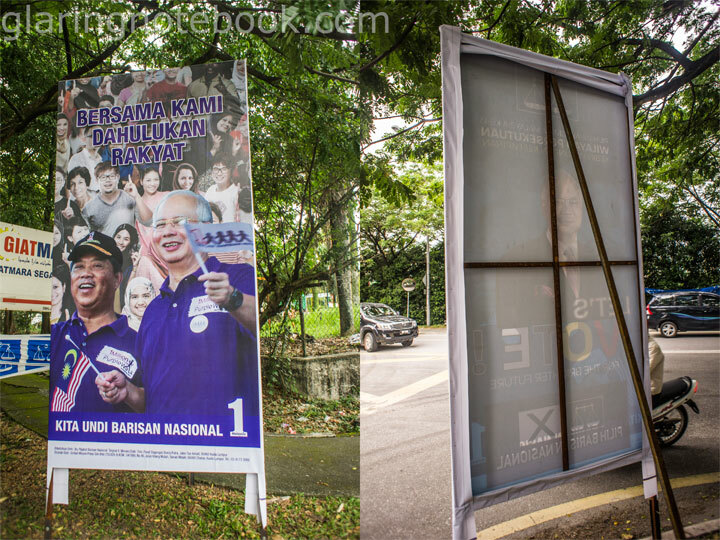 However, sometime this week, another poster was overlaid in front, this time featuring the incumbent Deputy Prime Minister, Muhyiddin Yassin. At the same junction, you see the same thing – Najib Razak’s original poster, overlaid by another poster featuring his favorite right-hand man. However, the address on my NRIC is in PJ, so I will be voting there instead. The other benefit of that is that I get to vote for a Parliament and State candidate. 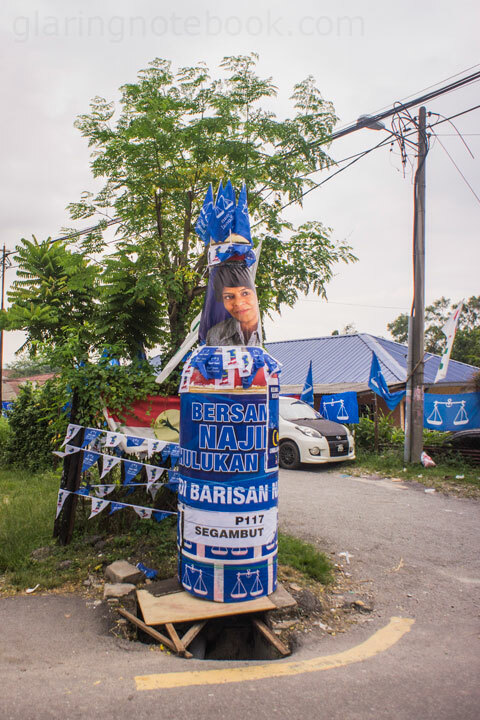 If I changed the address to this one in the Federal Territory of Kuala Lumpur, I’d only get to vote for a Parliament candidate. All pictures can be clicked for a larger view. This entry was posted in Pictures, Travelling on April 29, 2013 by 2konbla. What a total waste of taxpayers money. That is wahat BN does when it has too much budget. But just because they have budget doesnt mean that the rakyat will thnk highly of what they have done.